Aiyanna Faria is a 14 year old. West Haverstraw, NY Daughter of Sabrina Figueroa. Aiyanna was diagnosed in 2009 with Davidoff Dyke Mason Syndrome. Davidoff Dyke Mason Syndrome refers to atrophy or hypoplasia of one cerebral hemisphere (hemi atrophy) which is usually due to the developing brain in fetal or early childhood period. The clinical features are variable and depend to the extent of the brain injury. More commonly they are present with recurrent seizures, facial asymmetry, learning disability and speech and language disorders. Due to insurance we had to change doctors. We have tried every seizure medicines with no long standing results. She is currently having 10 -15 seizures a day and recently they have been more grand mal along with dizziness, migraines and vomiting. She has had several tests done and has no brain function on the left side of her brain. Her right side was fully functional and now since it has been so long that the right side is starting to be damaged, resulting in memory loss. She has had a number of surgeries recently to try to help but it is unknown what relief it will bring. Aiyanna is fun loving and despite these challenges has maintained a positive attitude. She is a go getter and will almost do anything just to be a normal 14 year old. Although we are realistic to the fact that there is no cure, we just need to give her as much time as possible. We want her to do as much as she can with little effects from her treatment and disease as possible. She deserves to be able to live her life as normal as possible. Thank you for your support. Click here to download a copy of the 2016 Cruisin for Kids Information Flyer. 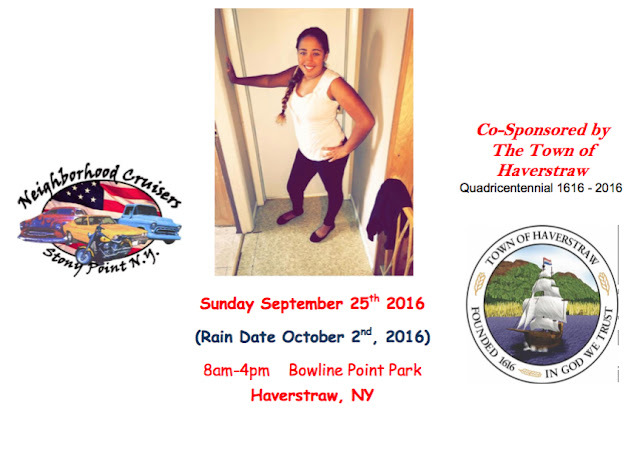 Click here to download the 2016 Cruising for Kids Charity Car Show Registration form.